Many proponents of alternative energy, serious energy conservation and carbon neutrality point to Germany as the exemplar amongst industrial nations. BayBuzz took advantage of ‘foreign correspondent’ Bridget Freeman-Rock’s recent extended sojourn in Germany to get a first-hand report on what that country is doing energy-wise, especially at the local level, and what Hawke’s Bay might learn from it. On New Year’s day, 6am, Germany reached an historic milestone as the country slept following Silvester celebrations and strong winds blew. For a moment in time, wind power alone produced 85% of Germany’s energy consumption, with hydro and biomass decking the rest. For a moment in time, Germany’s electricity was completely fossil fuel and nuclear free. The next day, having witnessed the moment in sleep, I flew back to New Zealand, following a four-month Heimatreise with my family. The trip had taken me from Berlin to the North Sea and down the west of Germany, through the densely populated Ruhrgebiet, the former industrial coal belt, along the romantic Rhine and Moselle valleys, to sunny, wealthy Baden-Wurttemberg in the south, the country’s top-ranked federal state for its energy transition efforts towards a carbon-neutral future. At the North Sea, we had stayed on the peninsula between Wilhemshaven and Bremerhaven – two key ports and centres for the development of windpower technologies. We had cycled on the flat, low-lying lands beside the UNESCO-protected Wattenmeer, cows grazing in super-green marshland pasture under the flapping rat-tat-tat-tat of wind turbines, while the horizon out to sea was filled with the massive pylons of an offshore windpark. Onshore wind power is the central pillar of Germany’s Energiewende (energy transition), producing 10% of the country’s electricity in 2016. With capacity significantly boosted in 2017, it makes up 40% of all power from renewables. Each of Germany’s nearly 29,000 onshore wind turbines has an annual output equating to the energy consumption of 1,000 average German households, and technological advances mean increasingly more efficient, powerful turbines (in ideal conditions, some of the latest models can power 6,000 households). Meanwhile, the biggest growth area is in wind turbines at sea, with a 49% jump from 2016 to 2017, and similar projections for 2018. Germany’s Renewables Act stipulates that total offshore wind power capacity grow to 6,500 MW by 2020, a goal it’s well on the way to meeting, with 1,200+ offshore wind turbines in Germany’s North and Baltic seas so far holding a potential capacity of 4,600 MW per annum. These kind of figures are impressive on paper, and the turbines are like giants in the landscape. However, when it comes to looking from the ground level at energy reduction and efficiency, and what steps can be taken to adapt society to more far-reaching change than ‘just’ switching to renewables, they’re less indicative of what’s possible than the smaller scale efforts and the local. Energy reductions in transport are a key ‘steering target’ under Germany’s climate goal of cutting total CO2 emissions by 40% by 2020 (compared to 1990 levels), and it’s the area Germany, on a national level, has made the least tangible progress on (2%) so far. 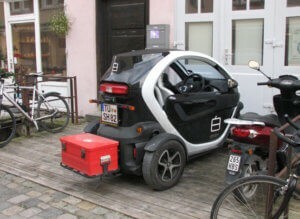 It does, however, have radical, functioning examples of rethinking ‘the car’ and our dependence upon it. Freiburg, at the foot of the Black Forest, is a cyclist’s city, and for many, the main mode of transport – it’s the most convenient, quickest way of getting around, with 500km of cycle lanes. But its internationally renowned eco-quartier, Vauban, on the outskirts of town, a 10-minute tram ride away from the centre, takes this to a whole new level. Home to some 5,500 residents, it’s been designed as a car-free neighbourhood. A fused grid lay-out filters out cars using cul-de-sacs and crescents that give way to a criss-crossing ‘green transportation’ network of footpaths and bike ways that connect everything up. Every home is within walking distance of a tram stop, and all schools, shopping centres and businesses in the Vauban vicinity. Most of the streets are no-parking zones, with residents who own cars obliged to lease a car lot in one of the multi-storey, solar-powered carparks on the main road. Around 70% of residents don’t own a car at all, and 39% of car-free households are members of Freiburg’s carsharing pool. Cycling accounts for 61% and 91% of all commuter trips, by car-owners and the carless respectively. The effect is a neighbourhood that’s truly people-centred and family-friendly – kids from a young age have the freedom (because it’s safe and overseeable) to play out in the streets, in the green spaces between houses, in the adventure playground commons. It’s interesting to note, that the original impetus came from the squatters and students who took over the former, abandoned French barracks in the 1990s with a vision for an alternative community. Grassroots activism led to changes at the top when a citizens’ organisation, Forum Vauban, was formed and solar energy and passive-design experts were brought on board to develop the plans. The city council, seeking to redevelop the site for family housing, collaborated with the Forum to bring a visionary concept to fruition. Construction: 1999-2006. 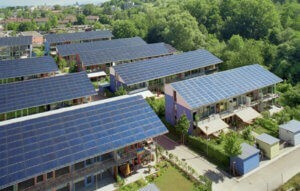 Vauban, Freiburg’s energy-efficient eco-quartier, including the Schlierberg Solar Settlement with its 59 energy-plus homes. Vauban is a showcase for Passivhaus architecture, with 170 units built as ultra-low energy houses, requiring no heating at, and using less than 15kWh/m2/yr. A further 70 are ‘energy-plus’ homes – producing more energy than they consume. Heating from a local heating network powered by renewable energy (RE) sources and the use of solar technology is the norm for most. The quartier’s best-recognised feature, perhaps, is Das Sonnenschiff (Sun Ship), which houses the organic supermarket, Alnatura, and other retail on the ground floor, three floors of office and commercial space and nine residential penthouses. 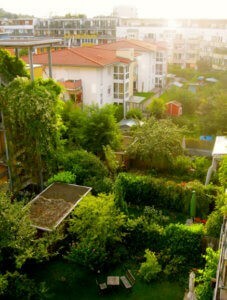 It’s designed for maximum efficiency (cool in summer, warm in winter) and produces four times the solar energy it needs. Surplus is fed into the grid and profits equally distributed within the Sonnenschiff community. 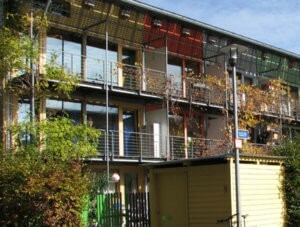 Low-energy building has been mandatory in Freiburg since 2011; its building codes stipulate energy inputs cap 65kWh/m2/yr (half the average German standard, which varies from district to district). For comparison: the NZ Building Code sets a minimum of 150kWh/m2/yr, with a typical construction in Queenstown, for example, using 250kWh/m2/yr. While Baden-Wurttemberg generates less wind and solar energy than other federal states, such as Lower Saxony and Mecklenberg-Vorpommen in the north, which have massive wind and solar infrastructure, it’s ranked top in its transition to a low-carbon future, largely due to the political will to make change at every level, and in particular its integration of cutting-edge energy-efficient solutions in new residential developments – such as Vauban and Rieselfeld (home to 10,000 residents) in Freiburg. 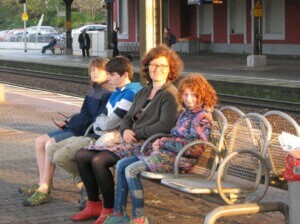 Bridget and children waiting on a provincial train platform. For their four month sojourn, the Rock family traversed Germany using regional train networks and urban public transport. It is the only federal state with a regenerative heating law, which requires all new building developments to ensure at least 15% of heating is sourced from renewables. And here, the city of Tübingen, 30 km south of Stuttgart, has pioneered a project that ticks every box in future-oriented, energy-efficient innovation. When its municipal works body was commissioned a few years ago to build a state-of-the-art communal heating station for a new residential quartier, the district’s wastewater treatment plant nearby was also due for an overhaul. The result: a synergetic, resource-savvy collaboration, an urban first on this scale. Instead of torching off the biogas generated from the anaerobic processing of so-called ‘sewerage sludge’ (waste-product of water purification) – the more usual practice – the biogas from the refurbished wastewater plant is used to power the new Blockheizkraftwerke, generating 75% of the heating and hot water needs for the 700 residents in the Alte Weberei; natural gas makes up the shortfall. Such localised heat networks are far more energy-efficient than each building operating its own heating system, and their advantage for local authorities in Germany is the multi-purpose opportunities they offer. A localised heat network can be used to service municipal facilities, as well as residential housing and commercial businesses, drawing on diverse sources of generated heat (solar thermal, heat produced by industry, small combined power and heat stations, surplus wind energy), which not only increases RE use (good for meeting climate targets!) but often improves air quality. As an aside, one of the coolest things I saw during our six weeks in Tübingen was a passive ventilation system: two large pillars of ice in a heated indoor swimming complex. The refrigerated steel surface draws the humidity from the air, which then freezes, before melting slowly into water that’s piped out and recycled. 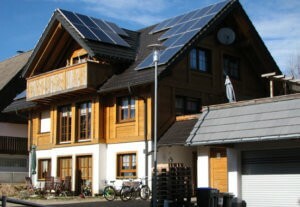 Private citizens are the biggest investors in renewable energy, here a home in the Black Forest. Germany is king at developing clever, novel ways of harnessing energy from waste products. Bioenergy is Germany’s second largest RE after wind, accounting for 24% of the country’s RE production. But it’s the most diverse of the renewables – biogas generated from energy crops, landfill, manure or ‘sewerage sludge’, biogenic waste (compost), biomass, both solid (waste wood) and liquid (plant oils) … the most expensive to produce, and mostly suited to localised, small-scale production. Modern farms increasingly generate their own power from the biogas won from maize silage plus animal manure sourced at site, like Hof Seveerns, a mixed horse stables and dairy farm on Butjadingen Peninsula. Or they generate bioenergy for their rural locality – as of 2016 there are 179 officially registered ‘bio-energy villages’ across Germany, aiming to supply their entire communities with 100% renewable electricity and heat. While less competitively placed than wind and solar, it’s brought an economic boon to many of these communities, and plays a starring role in local energy transition. It’s also the most stable, controllable RE in Germany, with huge potential for reducing waste and energy consumption for heating. 2017 figures show waste emissions have been cut by 71% (from 1990 levels). Citizen participation is seen as a key reason for Germany’s rapid uptake of renewable energies, made possible through legislative tools under the Renewable Energies Act (Erneuerbare-Energie-Gesetz 2001-2014) – and its predecessor the Electricity Feed-In Act (1991-2001) – that mandated change and, importantly, enabled access to small and medium enterprises, local body initiatives and cooperatives through its feed-in tariffs. These incorporated a “special equalisation” mechanism that offered higher renumeration per kWh to smaller sized producers and to yields that are harder won – such as windpower in less windy regions, and biogas that is more expensive to produce. In 2016, private citizens (as individuals and energy cooperatives) owned 31.5% of installed renewable power capacity in Germany – making them the most important investors in the sector, ahead of energy companies, developers, farmers, funds/banks etc. And with wind power, that proportion of private citizen investment was 39%. Angela Merkel’s government, however, has changed the playing field, with 2016 revisions to the EEG, replacing the FIT scheme with a tendering system that’s geared towards corporations and market forces rather than reliant on government regulation. While the first auctions in 2017 led to an initial surge in uptake and a dramatic drop in the price of RE, making it more cost-effective (to the consumer) than conventional energy in some cases, there are fears that the tendering system will disadvantage small and medium enterprises and energy cooperatives who don’t have the scale to compete or to weather the vagaries of the market. The risk critics perceive is that citizens will become mere consumers under the new scheme, and that citizen-initiated innovation (which has pioneered much of the more far-reaching changes) will be hindered, thus ultimately holding back the Energiewende. To meet its target to get 1 million electric vehicles on the road by 2020, government incentives include purchase grants, tax exemptions and free parking. As Philipp Vohrer, managing director of Germany’s Renewable Energies Agency, AEE, points out, “The acceptance of, and commitment to, renewable energy expansion depends on the possibilities citizens have to take part and invest.” Even more true, I would add, when it comes to reducing energy use and for increasing the number of integrated, cost-effective, energy-efficient systems. To my mind, what we in Hawke’s Bay can learn from Germany is not from its RE giants and stellar achievements (though they’re to be applauded). Instead, it’s from the example of countless smaller, decentralised, people-centred projects like Freiburg’s Vauban or Tübingen’s energy-efficiency programme, that have flourished under the original concept of the Erneuerbare-Energie-Gesetz (EEG). It takes bold, far-reaching legislation to transition to a low-carbon world, and it takes capital and savvy business, but most importantly it takes people who are enabled to implement the alternatives, to innovate, to take ownership, literally. To become the ‘we’ that makes the change. And this is my take-home message to Hawke’s Bay’s regional and local councils: let’s find possibilities to get us all involved and invested. Tübingen, an orderly yet dynamic city of 89,000 on the river Neckar in Baden-Wurttemberg, has one of the oldest universities in Europe (dating back to 1477) and its picture-book mediaeval city centre – crooked, cobblestone alleyways, half-timbered houses and thriving market square – has been exquisitely preserved. But, with students making up a third of its population, it’s also one of the youngest cities in Germany, and an instigator for change in the transition to a carbon-zero future. Green mayor Boris Palmer (who is halfway through his second eight-year term), has led a vigorous climate protection campaign since 2008, which the city council officially took up in 2015, ratcheting up its ambition to reduce CO2 emissions. It’s done this by breaking down the ‘climate load’ at an individual level, so everyone can take responsibility for their part. The Umweltbundesamt (Federal Ministry for the Environment) has calculated that on average each citizen in Germany generates 10,670kg of CO2 a year (approximately 30kg per day). The council has taken comprehensive measures to address each of the key areas (transport, electricity, heating and food) through education, support (consultation, funding), and carbon-neutralising its municipal infrastructure. 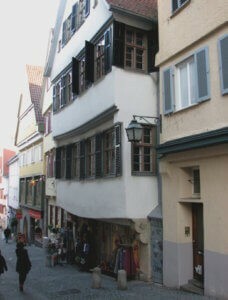 The campaign’s 2022 goal is to cut Tübingen’s CO2 emissions per person by 25% compared with 2014 levels. Tübingen aims to meet half of all the city’s electricity needs with locally-generated renewable energy (RE) by 2020. To this end, it has its own municipal-owned and operated power company, Ökostrom swt, which uses 100% RE, much of it already produced within Tübingen’s 108km2 area through multiple solar, wind and hydro plants. Over 12,000 households have signed-up to date. 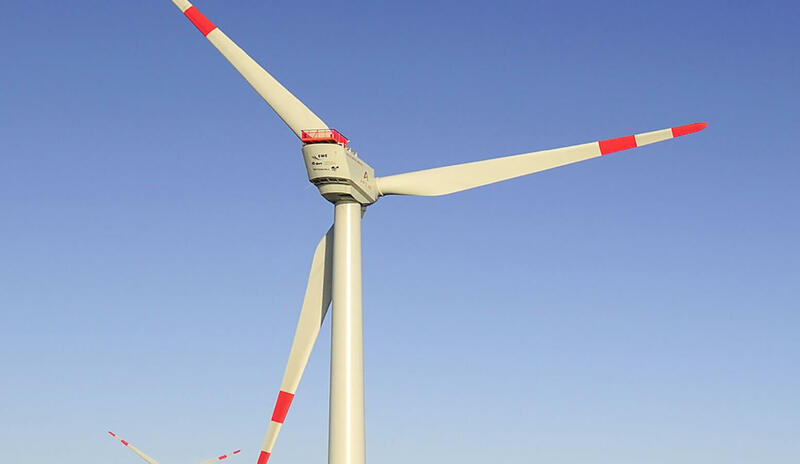 There’s an optional Ökostrom tariff to support RE development – Stadtwerke Tübingen (SWT), the district’s municipal works body, has significant investments in wind power throughout Baden-Wurttemberg. And incentives to sign on, such as public transport discounts and coupons towards the purchase of a new eBike or pedelec. 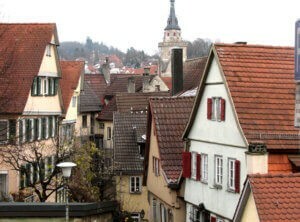 To encourage home-owners to install solar PV, Tübingen offers a lease-arrangement. Residents can lease solar panels from SWT (which will install them at no cost) rather than fronting up with a hefty outlay. Tübingen has a blue star certification it awards to local enterprises that have actively reduced their energy-use, and supports small and middle businesses towards energy and cost-efficient changes by providing energy consultation and finance for goal-oriented projects. This is undertaken by SWT in conjunction with an independent agency for climate protection and Tübingen University, which also offers its research facilities (and students) for undertaking innovative trials. SWT operates Tübingen’s popular bus network – with over 20 million individual bus trips taken a year, that’s at least 200 trips per capita – and is gradually replacing its fleet with more energy-efficient vehicles. It now has eight ‘Blauer Engel’ buses (the prestigious environmental accreditation), which, electric-powered using locally generated RE, produce zero CO2 emissions. To stabilise the RE power supply, Tübingen is shifting to smart grid technology, so fluctuations and seasonal variations can be accurately monitored and augmented. At one of Tübingen’s power transmission stations, surplus energy is siphoned off, converted to heat and piped underground through SWT’s 37km remote heat network, servicing 100 residential and commercial buildings with heating and hot water.